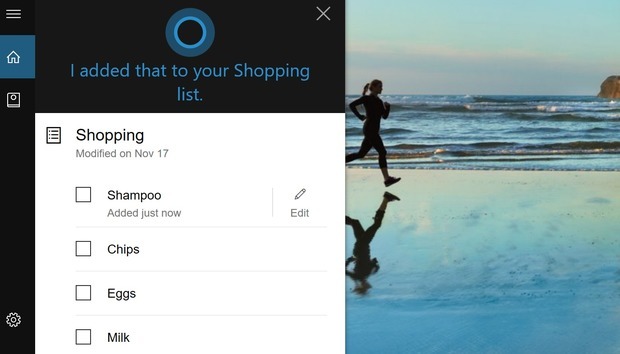 Just in time for the holidays, Windows 10’s Cortana has added a new feature: list-making, which you can use to add all sorts of shopping items, to-do tasks, and other items as you think of them. The new feature works on your Windows 10 PC, as well as Cortana for iOS 8.0 or later and the Cortana app for Android 4.4 and later. Microsoft also connected Cortana to its Wunderlist app, allowing access to the lists you already have in that app and easy sharing with friends. As you think of new items, you can issue commands to Cortana, such as “Add milk to my shopping list,” and Cortana will oblige. (Naturally, you can also edit the item name itself.) There’s no obvious way to orally check off items on your list without opening the list. For now, there’s also no way to add photos of items—a feature that exists in Cortana’s reminders—meaning you’ll have to set a separate reminder with, say, a photo of the bottle of wine you want to give to your sister.